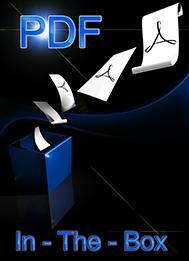 ALL In-The-Box can also generate PDF files. Additionally, it can display and print PDF documents being generated, with full programmatic control over these features. Support of Web-based architecture (ActiveX API only, to be used in ASP pages). Protection and encryption (RC4 encryption algorithm with 40- or 128-bit keys). Plain, rich and composite texts with full justification. The features detailed above concern PDF In-The-Box version 4. They apply to the ActiveX and Delphi APIs. At the moment, the DLL API is still available in version 3 only. So, it doesn't offer all the features listed above.